Symptoms are generally obvious, with severe tenderness along the anterior-lateral (outer-front) border of the lower fibula (little outer bone at the ankle) and often also at its tip. Commonly severe bruising and swelling occur in the first 48 hours. The outer leg may be tender up towards the knee and especially in such a case fracture must be excluded. 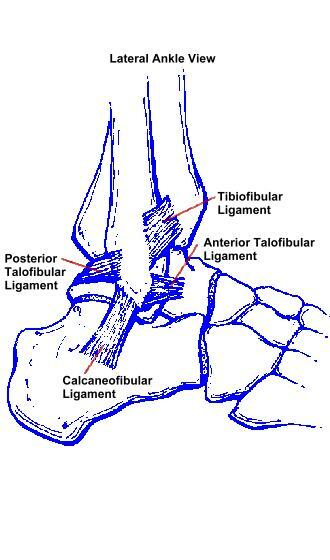 Ligament injuries may be confused or associated with ankle fractures in combination. Fractures may be caused by the same mechanisms and may be combined with ligament injuries or mimic them. In the child with open growth plates, injuries of the growth plate are often mistaken for "ankle sprains," which are rare in children. Diagnosis is based on physical exam and simple X-Ray of the ankle. Rarely are MRI or other imaging studies necessary. Laxity of the joint demonstrated by physical exam, guides treatment. Sometimes, stress X-Rays may be used to demonstrate instability. Ankle treatment is aimed at reducing pain and swelling with rest, ice and compression. In the case of significant ankle laxity, external ankle support aids ligament healing to as near normal as possible. With low grade or single ligament disruption support may be achieved with a functional ankle support. With high grade, multiple ligament injuries which are as unstable as ankle fractures, cast support or walking boots are indicated. Functional walking boots may give the same support as a cast, while allowing for daily bathing and early motion. These are often much more comfortable to wear, but more expensive. As swelling and pain subside, and early healing proceeds, strengthening of the supporting muscles of the ankle is indicated. This aids in stabilizing the joint and restores weakened muscles arising from pain and immobilization after injury. Exercises to aid balance on the effected leg also aids recovery. Surgery is rarely indicated after primary ankle sprain unless fractures coexist or the ligament sprain does not heal with significant improvement in stability, and therapy is ineffective at improving stability to an acceptable level. It is more important for the ankle to be stable against sliding in the front-to-back direction than stable against rolling under into inversion. This is probably also responsible for late arthritis in long term recurrent sprain. Ankle ligament reconstruction is occasionally necessary when ankle instability is recurrent and limits normal function. It may also be helpful to slow arthritic changes in an ankle with severe instability and resulting joint damage. This may require arthroscopy of the ankle joint to remove loose debris, along with ligament reconstruction. This is accomplished by advancing the ligaments originally torn free, tightening them, and sewing them in this position. In many instances one or more ligaments are not present because of recurrent sprain. In this case, new ligaments are created using a strip of peroneus brevis tendon. This is woven through the fibula and heel bone (calcaneus), through small drill holes, to create new ligaments which recreate normal stability. This allows high level function without pain or instability in 85% of cases or greater. Late cases of severe ankle arthritis may occur from chronic recurrent ankle injuries and instability. In this case fusion of the ankle may be indicated. With fusion, little loss of motion is generally noticed, but pain is reduced or eliminated. Ankle Fusion may be performed arthroscopically, generally allowing rapid return to ambulation and early fusion without the disability or healing delay resulting from open surgical fusion. Rehabilitation following ligament reconstruction of the ankle requires immobilization in a cast or walking boot for approximately one month. After Arthroscopy outlines basic surgical aftercare. During this time, early range or motion exercises may be instituted if a removable walking boot is utilized. Following this, a functional ankle brace should be worn within a shoe. This is used full-time for one more month. For the next month the splint is utilized for sports only. This results in a rapid functional return to activity during which the ligament reconstruction is protected as it heals and gains strength. Motion in the plane of ankle motion generally returns to essentially normal. Inversion of the ankle is slightly limited for several months, but this improves as the ligament reconstruction matures and remodels. A walking boot is utilized for one month. Following this, a functional ankle brace should be worn within a shoe. This is used full-time for one more month. For the next month the splint is utilized for sports only. This results in a rapid functional return to activity during which the ligament reconstruction is protected as it heals and gains strength. Motion in the plane of ankle motion generally returns to essentially normal. Inversion of the ankle is slightly limited for several months, but this improves as the ligament reconstruction matures and remodels. 1-4 weeks cast or walking boot stabilization with weight bearing as tolerated with crutches. 4-8 weeks Malleoloc or functional ankle brace immobilization. 8-12 weeks progressive return to high level activities with Malleoloc brace worn. 12 weeks onward, added activities and sports without external immobilization. Complications of ankle sprain itself is late instability, arthritis, or loose body formation. After surgical reconstruction, infection, graft failure, or limited range of the ankle may complicate the post-operative course. Quite often, small sensory nerves in the incision area function poorly for a month or two following reconstruction, but generally sensation returns to normal over the lateral border of the foot over two or three months. This is generally a nuisance only, and of no functional consequence. Significant complications are rare, and in general ligament reconstruction of the ankle results in about 85% good to excellent results. Ankle sprain is a common disabling injury generally treated with simple conservative measures. In cases of severe recurrent instability surgical stabilization is effective in returning patients to sports and work without limitations.